A popular (so called) Christian theology in many of our nation’s inner city or urban communities is “liberation theology” or a so called “social gospel”, which emphasizes resisting social oppression, whether racial, economic, or political. I reject “social gospels” and any concept of “liberation theology” as secular progressive doctrines that have done far more harm than good to communities where these ideologies have prevailed. The “great commission” as outlined in Acts 14:19-28, is clear. The PRIORITY of every bible believing church should be to win new souls to the body of Christ, establish these new believers disciples in the faith, and incorporate them into the local church. In effect, if a church is doing what the Bible commands it to do, evangelism, discipleship, and church planting would be it’s priority. When I look at the inner cities of our nation (I grew up in the inner city), I see a church on every other corner in communities that are plagued by infanticide (murdering our own babies), drug trafficking, gang activities, high murder rates, broken homes, etc. If the churches on every other corner were truly God called and fulfilling the great commission, then they would be communicating a new way of life that replaces the unhealthy social norms and the self destructive behavioral patterns of the community in which it exists by means of evangelism and discipleship. Something is deeply wrong with a church or so called Christian leader who pushes a so called social or “liberation” gospel while blaming the unchanged conditions of the community on government, racism or discrimination, as if God isn’t able to change our conditions if we first turn to Him in repentance and faith. The gospel of Jesus Christ is spiritual and is surely able to change both our spiritual and social conditions, but God will not honor a message that places social change above spiritual regeneration and discipleship. The fanaticism of the fringe in politics is rather alarming at times. It always leads to fanaticism and extremity. In the political world, you see the cult personalities and their fringe followers prostitute the church, the Word of God, and the over- simplistic minds of those who have been seduced into worshipping a man or a woman, rather than worshipping God. Never have I have seen that more applicable than with Dave Agema,- the Michigan Republican National Committeeman- and his fringe band of fanatical apologists. They even say that any Black American who does no “stand with Dave Agema” is “thinking with his/her color”. None of these extremes are new to the American people. America saw this kind of fanaticism over the personality of Jim Jones in the 70s, which ended up in hundreds committing suicide by drinking Kool Aide laced with poison. I doubt anyone will be committing mortal suicide in the cult of Agema. At least, I hope not. However, I think it is fair to conclude, given the public crucifixion of anyone not placing Agema above Jesus (by his fanatical fringe group), that mental, emotional, intellectual, and spiritual decadence clearly plagues those who drink the Kool Agema (and all cult figures) passes around to those seeking a human savior. The cult of personality never produces good results. “I appeal to you, brothers and sisters, in the name of our Lord Jesus Christ, that all of you agree with one another in what you say and that there be no divisions among you, but that you be perfectly united in mind and thought. My brothers and sisters, some from Chloe’s household have informed me that there are quarrels among you. What I mean is this: One of you says, “I follow Paul”; another, “I follow Apollos”; another, “I follow Cephas ”; still another, “I follow Christ.” Is Christ divided? Was Paul crucified for you? Were you baptized in the name of Paul? For Christ did not send me to baptize, but to preach the gospel—not with wisdom and eloquence, lest the cross of Christ be emptied of its power. Nothing but division seems to follow Dave Agema and his not so merry band of fanatics. All we can so is keep praying for them and try to mitigate as best we can the damage they do to our society at large. Has Prominent Black Detroit Pastor, Bishop Charles Ellis III, Sold Out to Secular and Homosexual Agenda? DETROIT, Nov. 12, 2014 /Christian Newswire/ — The Apostle Paul strongly criticized some church leaders of his time whose lives caused unbelievers to look upon the church as having no credibility and, ultimately, rejected God because some church leaders who supposedly represented God were no more morally sound than the average unbeliever. Paul was clearly suggesting that lifestyle evangelism is key to winning souls and those church leaders whose lifestyle did not reflect godliness were a detriment to the furtherance of the gospel of Jesus Christ. A strong case can be made that Bishop Charles Ellis III, of Greater Grace Temple in Detroit and Presiding Bishop of the Pentacostal Assemblies of the World (PAW) has indeed caused the name of God to be blasphemed or cursed among unbelievers and, thus, should give sincere consideration to stepping down to pursue his secular goals which have become pre-eminent to preaching the gospel to Bishop Ellis. For the past several years, Bishop Ellis has come under scrutiny for a questionable friendship with a practicing homosexual. In 2012, “Gay Christian Movement Watch” (GCM) did an editorial about Ellis which inquired as to whether he was in a gay church relationship. They noted how Ellis’ picture and personal Facebook page was listed as a supporter of a homosexual church. Ellis refused to directly respond to GCM when confronted about this association. Sadly, Ellis continues to open himself up for scrutiny, in light of the fact he currently travels with an alleged homosexual by the name of Rodney Howell, who does his hair and designs Ellis’ clothing. It, therefore, comes as no surprise that, when hundreds of Black Detroit Pastors stood up for Biblical marriage this year and denounced the homosexual agenda to redefine marriage, Ellis- one of Detroit’s most prominent pastors- was curiously silent and declined to stand with those who were defending the gospel. To add insult to injury, Bishop Ellis is now slated to star in a new Oxygen TV program “Preachers of Detroit”, which is a spin-off of the “Preachers of L.A.” television show, that came under harsh criticism from Black Pastors across the nation. Bishop T.D. Jakes went on record as identifying the “Preachers of L.A” as “junk” to his congregation. Suffice to say Rev. Perkins and Bishop Jakes would equally criticize the notion of a “Preachers of Detroit” reality show, which will have the same damaging impact on the ability of legitimate pastors to win souls to Jesus Christ. The moral of the story is that, in light of Ellis’ refusal to denounce any association with a homosexual church, an alleged homosexual hairdresser and clothing designer, his history of being identified as an empathizer with the homosexual agenda, along with his current commitment to turn the house of God into a sideshow for entertainment purposes, it is time for Bishop Charles Ellis to step down as a pastor and stop causing unbelievers to curse the name of Jesus Christ. The Thomas More Law Center (TMLC), a nonprofit public interest law firm based in Ann Arbor, Michigan, late Friday afternoon (Nov. 7), filed an amicus brief (friend of the court brief) in the Fifth Circuit Court of Appeals urging the Court to affirm a lower federal district court decision which upheld Louisiana’s traditional marriage law. 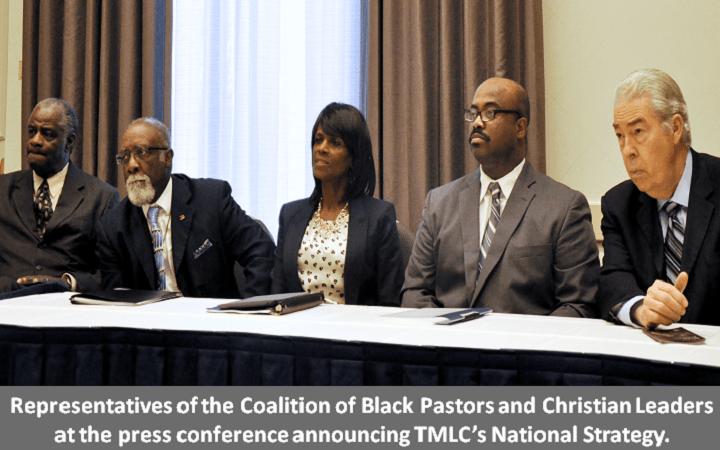 As a part of its national strategy to defend traditional marriage, TMLC formed a team of lawyers to file friend of the court briefs (amicus briefs) on behalf of the National Coalition of Black Pastors and Christian leaders. The team consists of TMLC’s senior trial counsel, Erin Mersino, and Co-counsels William R. Wagner and John S. Kane of Lansing, Michigan. The team is tasked with filing briefs in significant cases dealing with the issue of traditional marriage. The Law Center’s briefs reflect the view of a majority of African-Americans: that discrimination because of one’s sexual preference is not the same thing as racial discrimination and that tradition and morality should not be discarded as a basis of the law; as the pro-homosexual judges have done in their opinions. TMLC’s brief is the fourth brief filed on behalf of the National Coalition of Black Pastors and Christian Leaders. It presents the unique perspective of African American religious leaders that discrimination because of one’s sexual preference is not the same thing as racial discrimination.